Always stop, pause, rebuke. Try not to cave in to the devils whims. Once he or she is let in, they grab a hold. 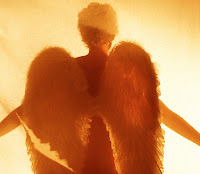 We have angels, when asked will stand up to the wiles of the enemy.